The Road Pavement is the portion of the road located directly above the subgrade, and beneath any wearing surface. In urban areas it is often bordered by kerb & channel, and in rural areas by road shoulders. It is typically constructed from compacted imported material such as crushed rock. The road pavement is sometimes broken up into two components, namely the base and the sub-base. The Glossary of Austroads Terms defines pavement as "that portion of a road designed for the support of, and to form the running surface for, vehicular traffic." and "the portion of the road, excluding shoulders, placed above the design subgrade level for the support of, and to form a running surface for vehicular traffic." The useful life of a road pavement will depend on a number of factors including soil conditions, the material it is made from, its thickness, its surface type and climate. The table below shows the useful life for road pavements adopted by a number of Councils. Please feel free to add your Councils information. 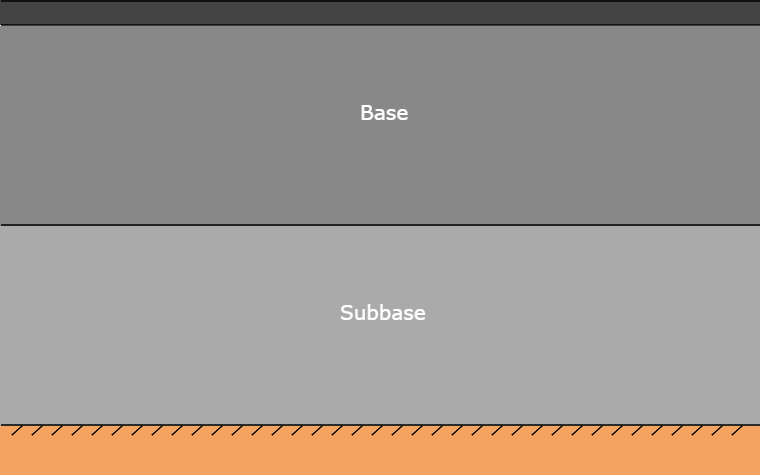 Section 8.3.14 of the Data Standard for Road Management and Investment in Australia and New Zealand V2 defines the 'pavement' as the portion of a road (typically granular layers) placed above the design subgrade level for the support of vehicular traffic, and upon which the pavement surface (wearing course) is applied.